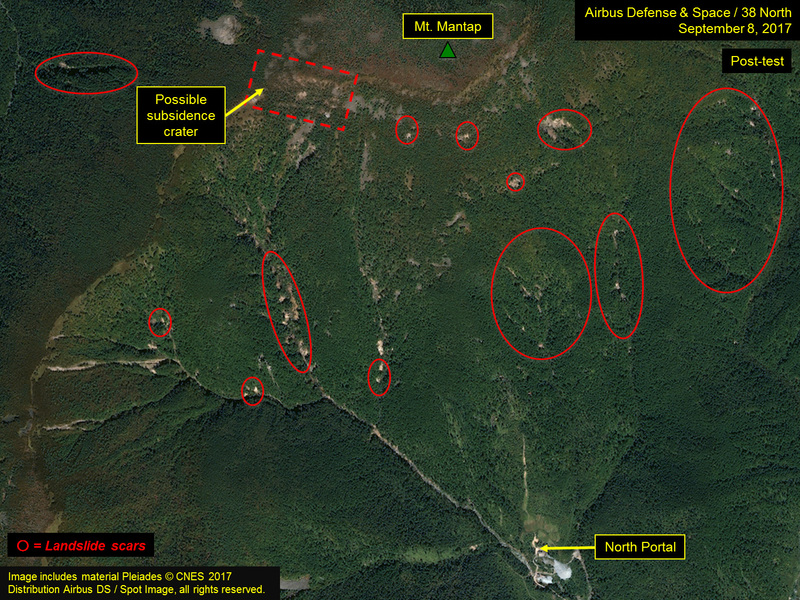 New commercial satellite imagery confirms earlier 38 North analysis identifying numerous landslides throughout the Punggye-ri Nuclear Test Site on the slopes of Mt. Mantap (and beyond) resulting from North Korea’s sixth nuclear test. 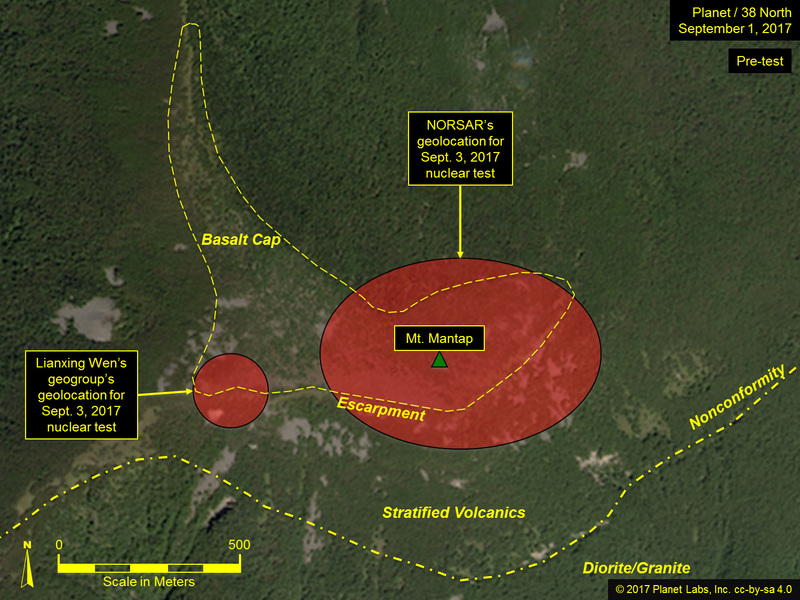 These disturbances are more numerous and widespread than seen after any of the North’s previous five tests, and include additional slippage in pre-existing landslide scars and a possible subsidence crater. However, it is unclear from the imagery whether this subsidence is due to what has been reported as “a cave-in that was externally observable,” associated with the 4.6 magnitude event that occurred eight minutes after the test. There also appears to be increased water drainage in the North Portal Area, likely stimulated by the large underground nuclear test. Such underground water flow stimulation (brought about by expansion of existing cracks and fissures) could also be expected to promote the transport of radionuclides to the surface, and is not inconsistent with a more recent report that some radionuclides (traces of Xenon-133) were detected in the environment following the test (by South Korea). 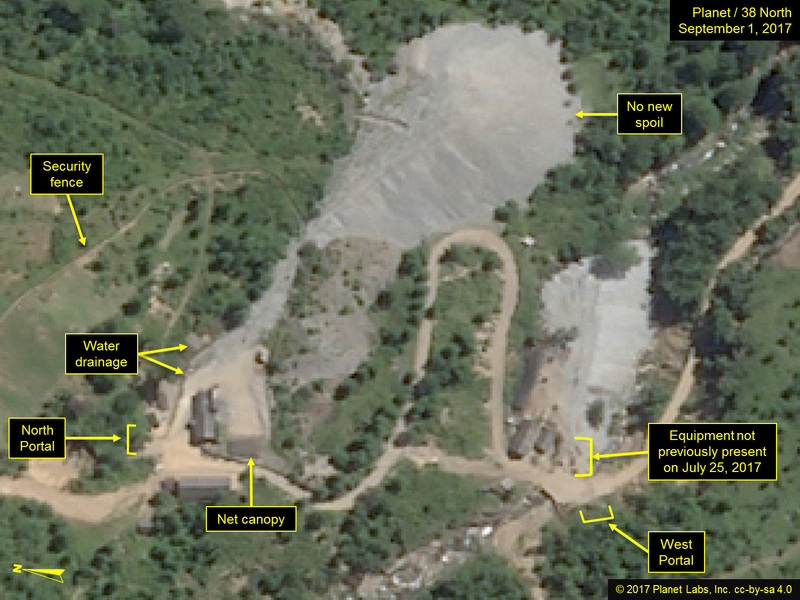 Imagery from September 8 also shows a large tractor/trailer cargo truck in the South Portal Area for the first time, and mining carts and other equipment are present outside the West Portal. 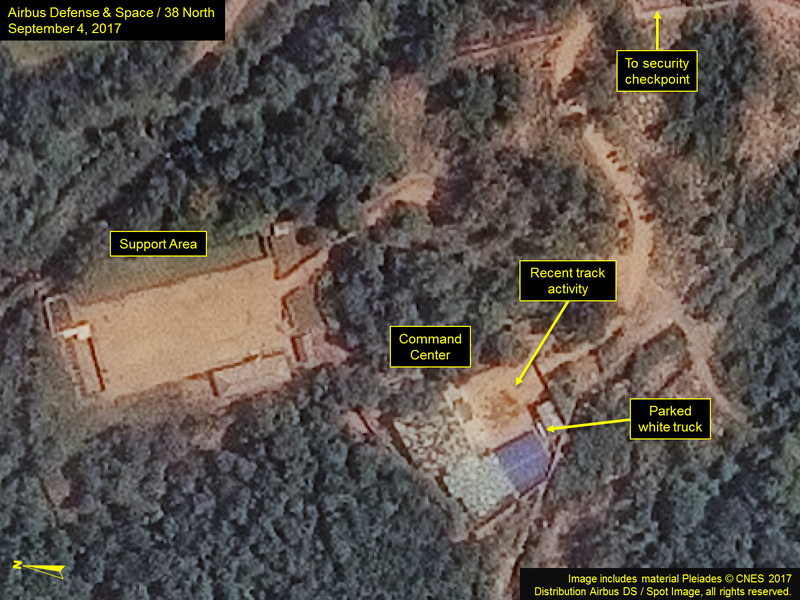 Such activity, coming shortly after the largest underground nuclear test conducted at Punggye-ri to date (via the North Portal), suggests that onsite work could now be changing focus to further prepare those other portals for future underground nuclear testing. At the time of 38 North’s first report on the sixth nuclear test, the preliminary seismic magnitude estimates varied from 5.8, as published by both the CTBTO and NORSAR, to 6.3 by the United States Geological Survey (USGS). More recently, both the CTBTO and NORSAR have officially revised their estimates upward to 6.1. This revision is significant because, rather than providing an equivalent yield of about 120 kilotons derived from the lower magnitude estimates, the application of standard formula with appropriate constants shows that the yield can now be estimated to have been roughly 250 kilotons (one quarter megaton). 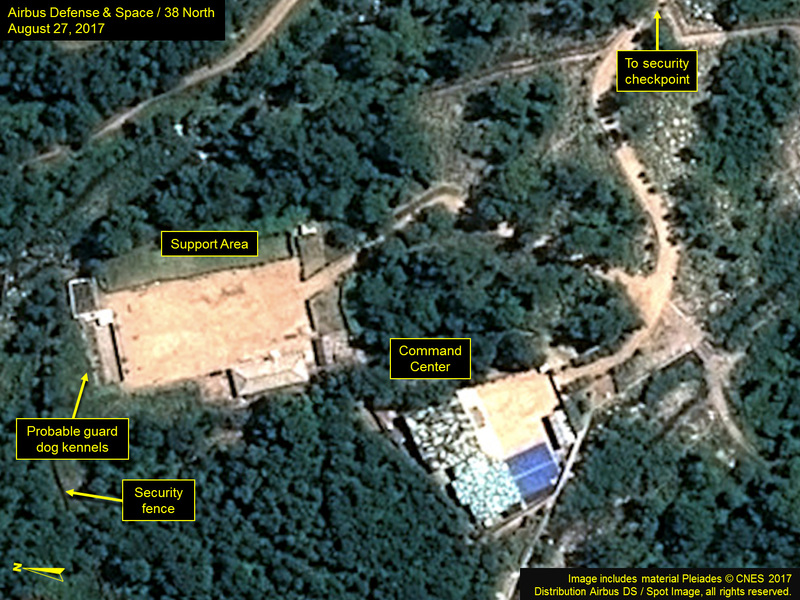 This large explosive yield is also quite close to what 38 North had previously determined to be the maximum estimated containable yield for the Punggye-ri test site. The CTBTO also published a very useful graphic illustrating the relative strength of this most recent and sixth underground nuclear test vis-à-vis the DPRK’s previous five acknowledged tests to date (Figure 1). Figure 1. 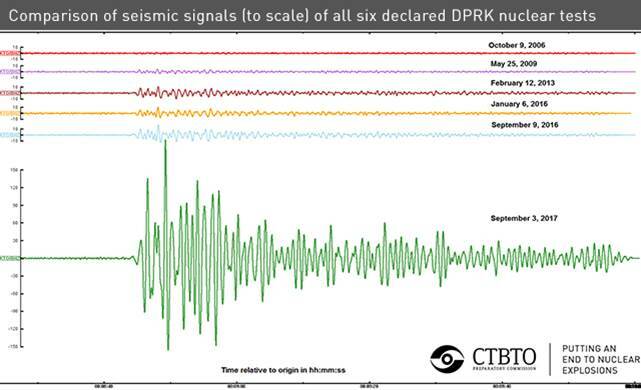 Comparison of seismic signals of North Korea’s six nuclear tests by the CTBTO. 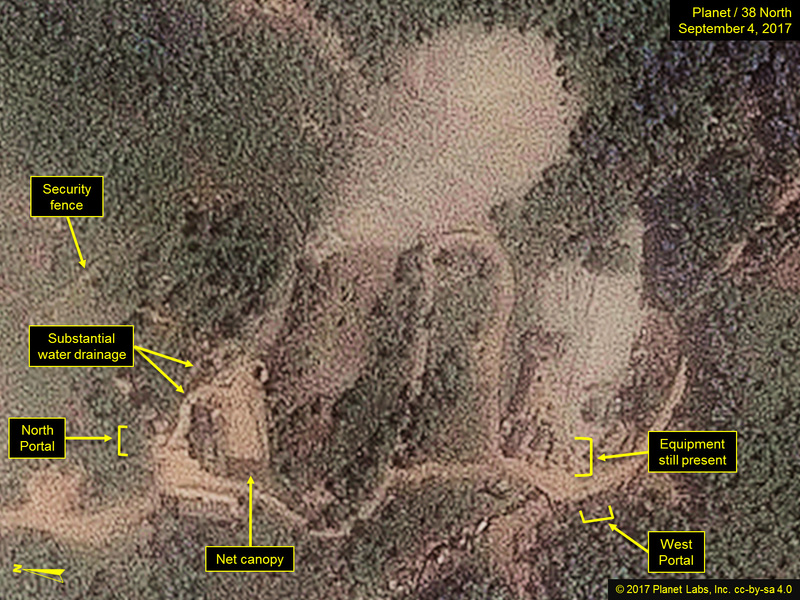 Multiple satellite images of the Punggye-ri Nuclear Test Site following the nuclear test form a mosaic of new information on post-test effects and activities around the site. To date, we have only two seismically derived relative geo-location estimates for a more precise location of the September 3 test and both of them place the event under Mt. Mantap as shown in Figure 2A. The first, by the seismic analytical team at NORSAR, shows a roughly 700 meter wide error ellipse, while the second estimate by the Lianxing Wen’s Geogroup is a bit further to the west of the peak with a claimed error circle diameter of 200 meters. 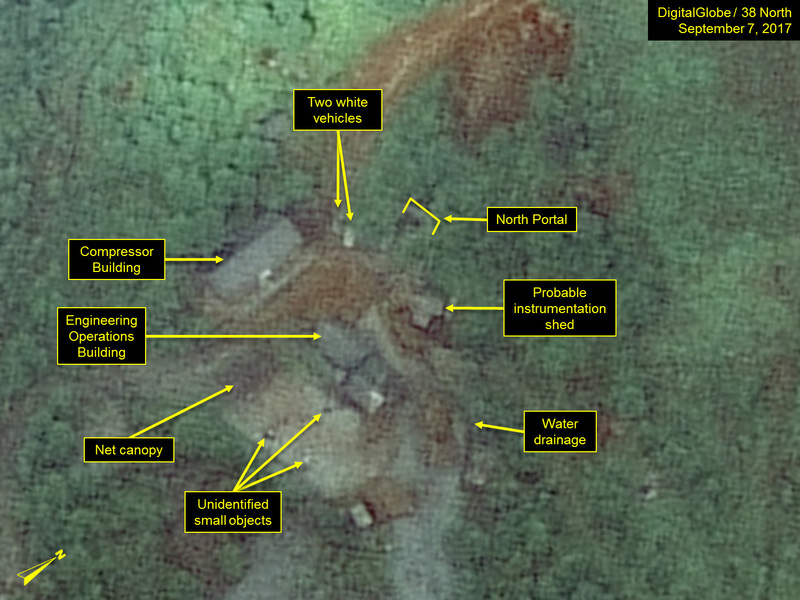 Both are consistent with our expectations that the North Koreans would seek to utilize the maximum available overburden (~800 meters) at the site using the same North Portal as was used in the previous four tests. An apparent rectangular subsidence “crater” appears in the stratified volcanics at the basalt escarpment lip on the western corner of Mt. Mantap (Figures 2B and 2C). This “crater” is likely what has been reported as a possible “collapse chimney crater,” but could also just be induced slippage prompted by the massive tremor. We may know more once synthetic aperture radar (SAR) imagery becomes available to potentially plot the epicenter of all of the surface disturbances. Figure 2A. Geo-location estimates for September 3 test under Mt. Mantap. Figure 2B. 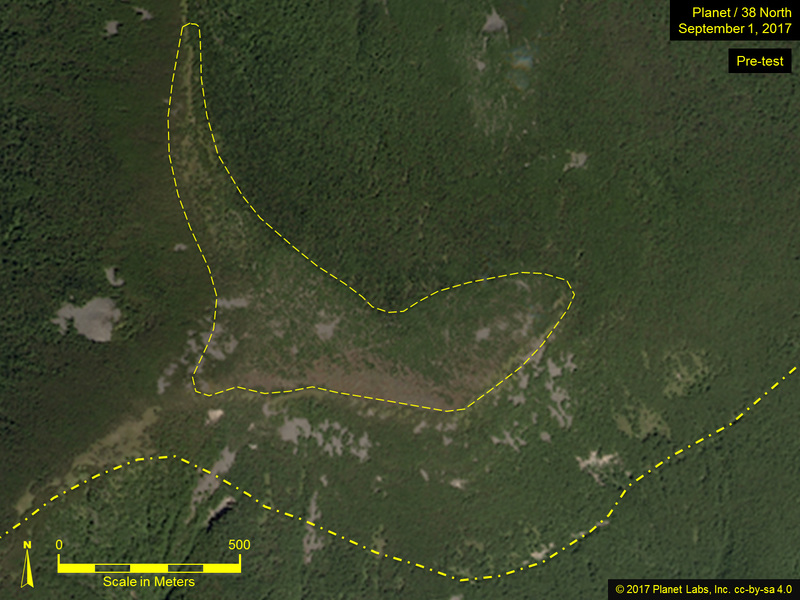 Possible subsidence crater and several landslide scars visible in post-test imagery of Mt. Mantap. Figure 2C. Close-up of subsidence crater. A comparison of pre- and post-test imagery of the North Portal (Figure 3) shows some changes. Most importantly, imagery of September 4 showed a significant increase in the water drainage flow emanating from the tunnel used in the conduct of this test, suggesting that the tremors had likely stimulated that increased flow. On September 7 (Figure 4), what appeared to be two white vehicles were parked near the North Portal. (Note: The appearance of such vehicles is not a common occurrence and their presence could be indicative of a post-test inspection effort.) Recent rains converted much of the area from dry earth to mud, but no evidence of landslides was visible in the immediate vicinity of the North Portal. Other small, unidentified, objects were also noted in the parking apron located on the south side of the engineering operations building. 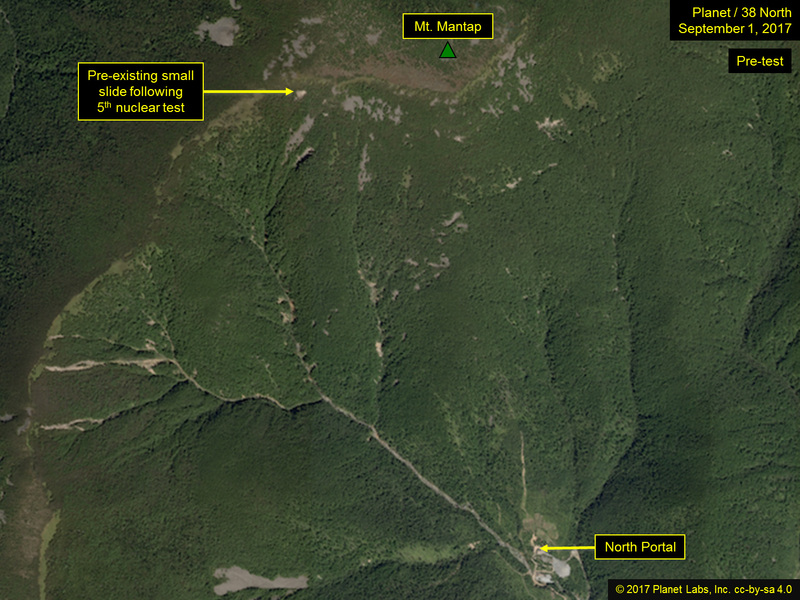 More recent imagery from September 8 (Figure 5) shows that the white vehicles are no longer present. Figure 3. Pre- and post-test imagery of the North and West Portals. Images © 2017 Planet Labs, Inc. cc-by-sa 4.0. Figure 4. White vehicles identified near the North Portal on September 7. Figure 5. While white vehicles no longer present near the North Portal, equipment or mining carts are identified near the West Portal on September 8. 38 North reported new equipment being present outside of the West Portal on imagery from August 27, which was the first significant activity in that area since late March. The most recent imagery from September 8 shows some mining carts on the rail line that extends from the West Portal to the spoil pile. This may be a prelude to new tunnel excavation activity (Figure 5). For the first time in over a year, activity was noted within the South Portal Area. A large tractor/trailer cargo truck was located in the area between the primary and secondary tunnel portals (Figure 6). The purpose of the vehicle is as yet unknown. Figure 6. Activity noted at the South Portal in over one year. 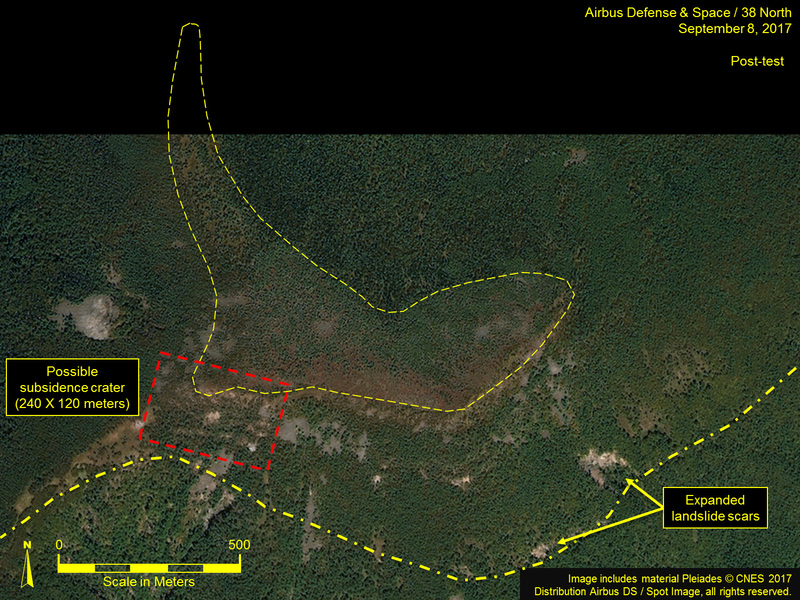 Pre- and post-test imagery of the main administrative support area (Figure 7) shows little change and no obvious vehicle tracking. The spatial resolution and the perspective of the post-test imagery were insufficient to determine whether or not the monument/pavilion observation point had been removed. The greenhouse remains uncovered. 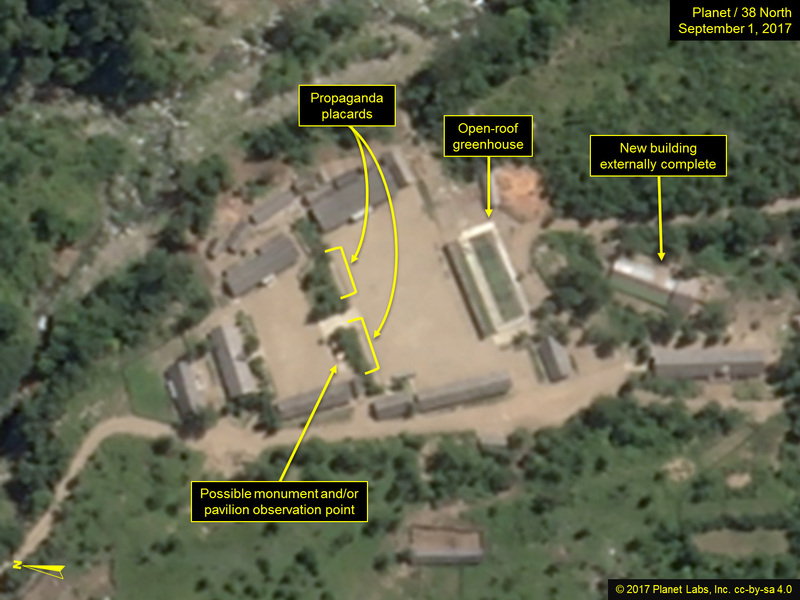 Imagery from September 8 (Figure 8) shows a few minor changes, including the possible removal of the propaganda placards, although additional imagery from a more southerly perspective would be necessary to confirm. Figure 7. 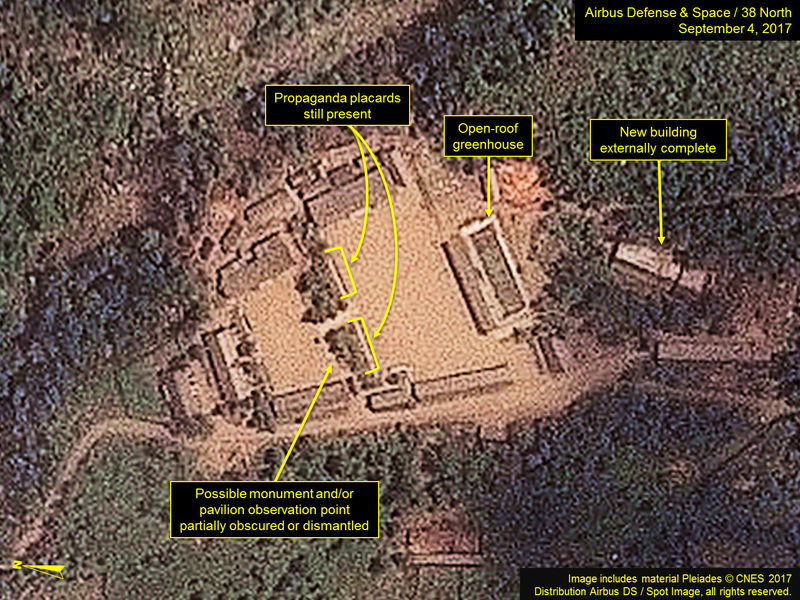 Main Support Area shows little change in pre- versus post-test imagery. Figure 8. 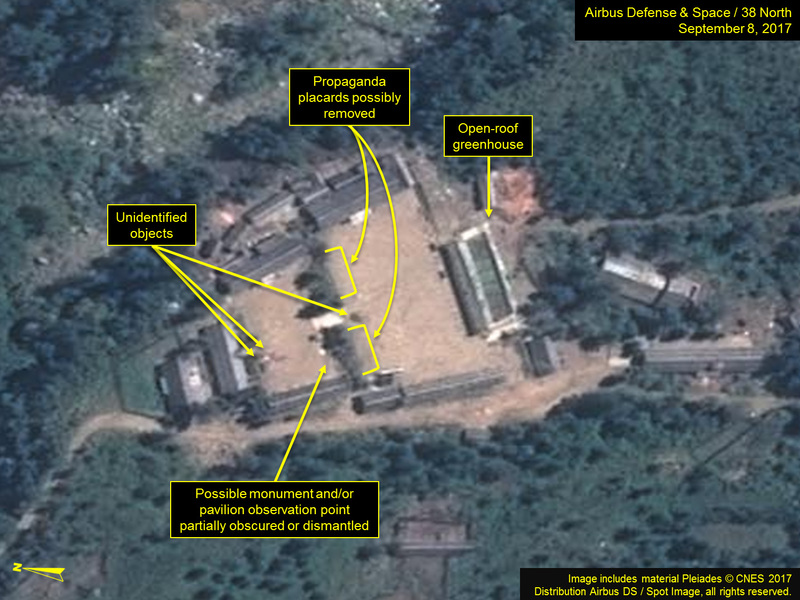 Minor activities identified at the Main Support Area on September 8. 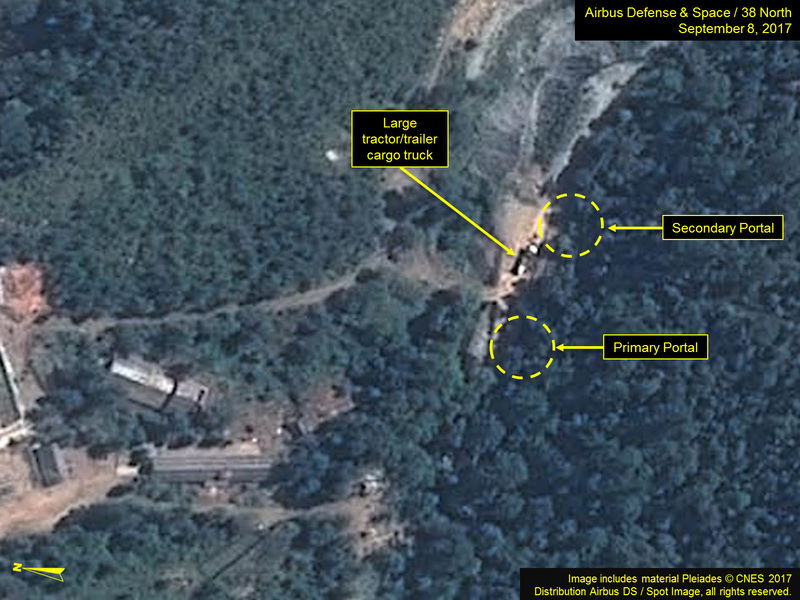 A comparison of pre- and post-test imagery of the Command Center (Figure 9) shows that a long white truck had been moved next to a vehicle parking shed located inside the courtyard of the Command Center in imagery from September 4. New vehicle tracking was also present in the courtyard area. However, that white truck was no longer present in imagery from September 7 (Figure 10). It is possible that this vehicle was involved in the transfer of test support equipment associated with the most recent test, although we cannot confirm this based on imagery alone. Figure 9. 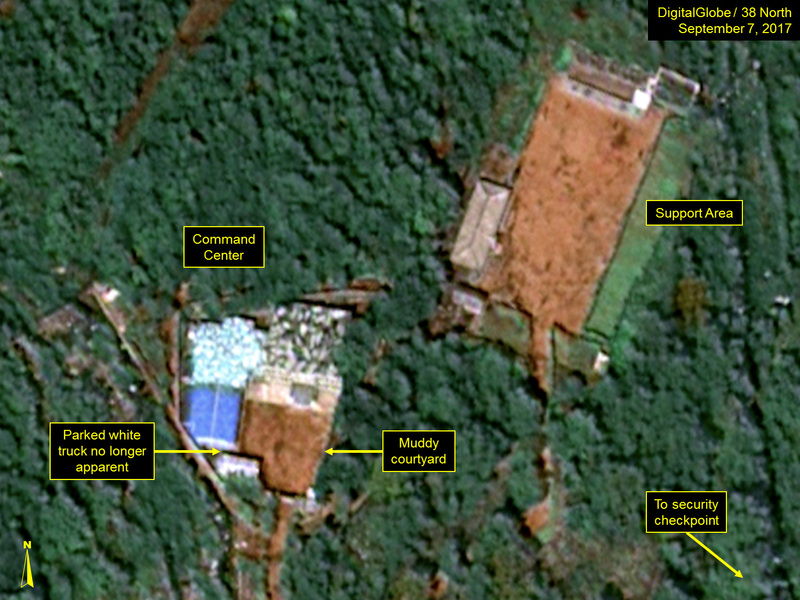 Pre- and post-test imagery of the Command Center area shows movement of a white truck and recent track activity after the nuclear test. Figure 10. 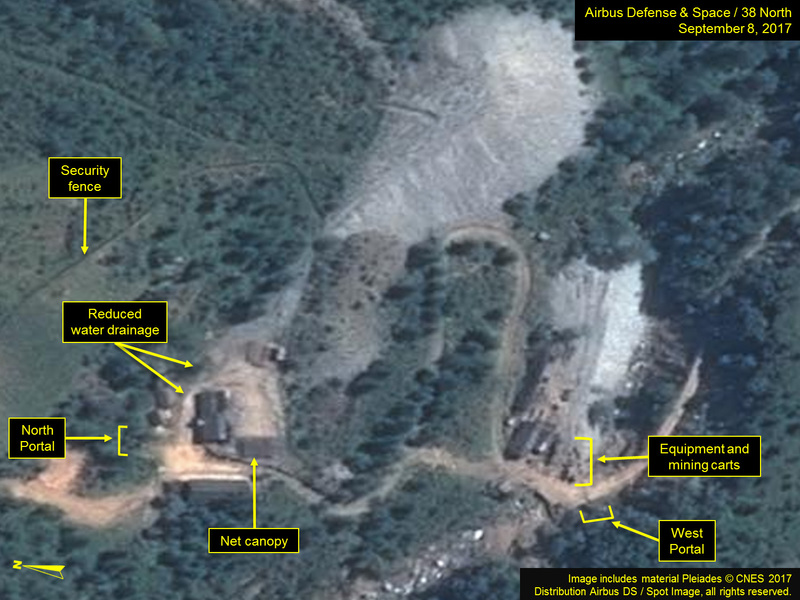 White truck no longer present in imagery from September 7. There was also one report of concern that Mt. Mantap might actually collapse as a result of the nuclear testing beneath it. Such reports of the mountain’s demise are highly exaggerated, although there is little doubt that there would have been significant “cracking” (possibly extending to the surface) as well as significant “irreversible strain” resulting from this event. Such cracking facilitates radioactive gas seepage in other environments. It remains to be seen, however, whether or not the North Portal will ever be used for another nuclear test. There are still two unused additional tunnel complexes (served by the South and West Portals) that are also deemed potentially capable of further nuclear testing, albeit for tests having lower yields than that of the sixth test. Additional information on the type and extent of the radionuclide dispersal will likely be addressed by the CTBTO in the near future. We also see no reason to alter our previous assessment that regardless of whether this most recent test was an operational warhead for an ICBM or simply a device, the yield of the test clearly shows North Korean progress in increasing the yields of their nuclear weapons. The significance of this is that it has the potential to dramatically increase the threat posed by its Strategic Force (responsible for ballistic missiles) as individual nuclear warheads potentially now have 10-times (or more) greater destructive power. This would allow fewer missiles to be employed to ensure destruction of a given target, and increase the target areas threatened by North Korean ICBMs by allowing a larger number of targets to be engaged with the current missile inventory. If the claim that the device just tested has a variable yield is true (from tens to hundreds of kilotons), then this may also imply the North Koreans intend to adopt an expanded policy of using nuclear weapons, including tactical use, in addition to deterring threats to existence of the state. By doing so, they would join countries such as the United States, Russia, China, Pakistan, etc. that have policies regarding the use of tactical nuclear weapons, clearly further destabilizing the Korean peninsula situation. For instance, see: Brendan Thomas, “Tactical Nuclear Weapons In the Modern Nuclear Era,” Lowy Institute, September 30, 2016, https://www.lowyinstitute.org/publications/tactical-nuclear-weapons-modern-nuclear-era; Mark Schneider, “Russian Nuclear Weapons Policy,” Real Clear Defense, April 28, 2017, https://www.realcleardefense.com/articles/2017/04/28/russian_nuclear_weapons_policy_111261.html; Sajid Farid Shapoo, “The Dangers of Pakistan’s Tactical Nuclear Weapons,” The Diplomat, February 1, 2017, http://thediplomat.com/2017/02/the-dangers-of-pakistans-tactical-nuclear-weapons/; Mansoor Ahmed, “Pakistan’s Tactical Nuclear Weapons and Their Impact on Stability,” Carnegie Endowment for International Peace, June 30, 2016, http://carnegieendowment.org/2016/06/30/pakistan-s-tactical-nuclear-weapons-and-their-impact-on-stability-pub-63911; and Dave Mujamdar, “On the Brink: When Russia Would Use Tactical Nukes on NATO,” The National Interest, February 22, 2016, http://nationalinterest.org/blog/the-buzz/the-brink-when-russia-would-use-tactical-nukes-nato-15281.